A recent report published by Infinium Global Research on intelligent pumps market provides in-depth analysis of segments and sub-segments in global as well as regional intelligent pumps market. The study also highlights the impact of drivers, restraints and macro indicators on the global and regional intelligent pumps market over the short term as well as long term. The report is a comprehensive presentation of trends, forecast and dollar values of global intelligent pumps market. According to the report the global intelligent pumps market is projected to grow at a CAGR of 6.2% over the forecast period of 2018-2024. An intelligent pump has the ability to regulate and control flow or pressure. The key benefits of intelligent pumps are energy savings and system cost reductions. Intelligent pumps have the potential to improve process control, enable better management of its health, and assist all power generation plants in reducing total energy consumption. In intelligent pumping systems, energy accounts for more than one-third of total lifecycle costs. Because of the energy-intensive nature of pump systems, the energy saving advantages of intelligent pumps will be a significant contributor to growth. Improving pump station efficiency and remote monitoring are the major factors that are driving the intelligent pumps market. Intelligent pumps facilitate energy efficient processes. Hence, the demand for minimization of manual operations and automated regulations to regulate and control the flow of fluid, which in turn, drives the growth of the intelligent pumps market. In addition, the intelligent pump's system offers the ability to access real-time operating data on the pumping equipment this, in turn, is boosting the growth of the intelligent pumps market. On the other hand, tax credits and government economic incentive packages targeting infrastructure projects, including water & wastewater and energy efficiency projects and replacement of old- aged pumps with intelligent pumps with are expected to have a positive impact on the growth of intelligent pumps. On the other hand, need to develop necessary instrumentation and electronics background to sell and support intelligent pumps for the distributors is one of the most significant challenges for intelligent pumps market. Furthermore, the most beneficial use of intelligent pumps is in the wastewater and water industry in which the expansion of smart cities gives rise to enormous opportunities for intelligent pumps applications. Among the geographies, Europe dominated the intelligent pumps market. The growth in the European region is due to a strong demand for clean drinking water that requires intelligent pumps. 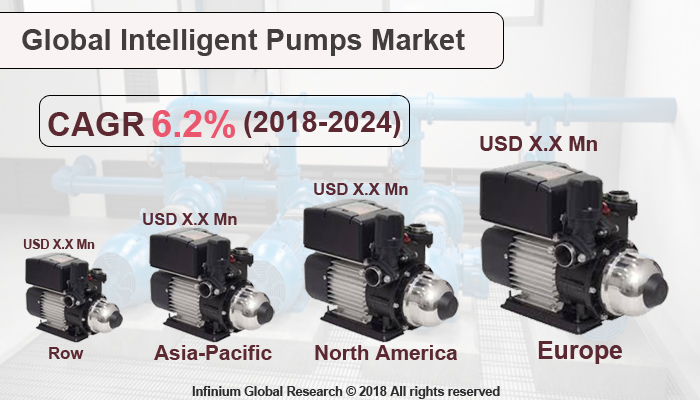 Moreover, government investments in industrialization and urbanization are anticipated to boost the intelligent pumps market in the Asia-Pacific regions. On the other hand, China is one of the major exporters of cheap pumps to the Middle East and Africa, as they do not have domestic bases for pumps. The report on global intelligent pumps market covers segments such as pump type, component, and end user. On the basis of pump type, the global intelligent pumps market is categorized into centrifugal displacement and positive displacement. On the basis of component the global intelligent pumps market is categorized into pump motor, variable speed drive and control systems. On the basis of end user the global intelligent pumps market is categorized into building automation, water & wastewater, oil & gas, chemicals and power generation. The report provides profiles of the companies in the global intelligent pumps market such as Grundfos Holding A/S, Goulds Pumps, QuantumFlo, Inc., Kirloskar Brothers Limited, Alfa Laval, ITT Corporation, Xylem, Inc, Sulzer Ltd., and Flowserve Corporation. The report provides deep insights on demand forecasts, market trends, and micro and macro indicators. In addition, this report provides insights into the factors that are driving and restraining the global intelligent pumps market. Moreover, IGR-Growth Matrix analysis given in the report brings insight into the investment areas that existing or new market players can consider. The report provides insights into the market using analytical tools such as Porter's five forces analysis and DRO analysis of intelligent pumps market. Moreover, the study highlights current market trends and provides forecast from 2018-2024. We also have highlighted future trends in the intelligent pumps market that will impact the demand during the forecast period. Moreover, the competitive analysis given in each regional market brings insight into the market share of the leading players. This report will help manufacturers, suppliers, and distributors of the intelligent pumps market to understand the present and future trends in this market and formulate their strategies accordingly.